The Ramada All Suites Hotel & Conference Center is located in the heart of Niagara Falls, Ontario, just a few minutes from the Falls & Casino Niagara. For the ultimate in luxury, select a suite with heart shaped whirlpool bath, or the 1000 square foot Roman Penthouse with private balcony, double sided wood burning fireplace, Roman double jacuzzi and more. Enjoy casual relaxation in the Japanese spa indoor pool complex and the seasonal outdoor pool and sun deck. Other great amenities at this Niagara Falls all suites hotel include complimentary newspaper, complimentary parking, multi-lingual support, business centre and safety deposit boxes. 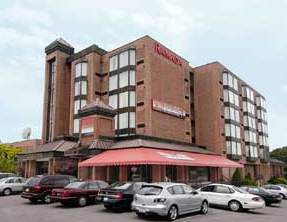 The Ramada All Suites Hotel and Conference Centre is located on Lundys Lane, in Niagara Falls Ontario Canada. The hotel provides easy access to all the excitement the attractions near the Horseshoe Falls have to offer. Only a short drive to the Falls and directly across the street from the Canada One Factory Outlet Mall, this Niagara Falls Hotel offers guests easy access to all the attractions, shopping and dining in Niagara Falls. The Ramada All Suites Hotel features free wireless high speed Internet access, indoor pool, seasonal outdoor patio, Tour Desk, baby-sitting services, snack and vending machines and free parking. All deluxe suites offer free high speed Internet access, two telephones, two televisions, iron and ironing boards, AM/FM alarm clock radio, hairdryer, individual heat and air controls and voice mail. Meet with success at the Ramada All Suites Hotel and Conference Center where business is our pleasure. This Ramada Hotel offers nine versatile rooms catering to groups of 12 to 300 for meetings, conferences, weddings or social events. For superb meetings, conferences, weddings or social occasions, the facilities at Ramada All Suites Hotel & Conference Centre feature 12 completely versatile rooms, catering to groups of up to 300 people. The in house business centre provides complete audio visual aids, telefax, dataport and photocopy service. Your next Niagara Falls conference is sure to be a success with one large ballroom to host meetings and meals separately, with additional break-out meeting rooms available. The Ramada Conference Centre features over 7,000 square feet of meeting and banquet space. Unobstructed meeting and function rooms are versatile and professionally designed to assure the success of any function.